(Last updated 8th September 2015) You can reach Koh Chang on the day of your arrival at Bangkok International Airport (Suvarnabhumi), provided that your arrival time is before 1pm. Any later, and depending upon immigration delays, or other delays, you'd do best by staying at a hotel close to the airport. We can arrange this for you at prices from around 700 baht. 3,900 and 5,500 baht for this service, depending upon the number of passengers. Any price we quote will include highway charges and ferry tickets. The Koh Chang Suvarnabhumi Burapha bus (also known as the Lonely Beach Express) which will bring you all the way to your resort on Koh Chang (as far as Lonely Beach on the West coast). There are 3 departures each day, at 07:50, 11:00 and 14:00. 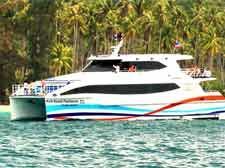 The 14:00 bus is scheduled to get you to the pier in time for the last ferry to Koh Chang. This service departs from the ground floor of the airport terminal building - there's a booking desk at door 8. 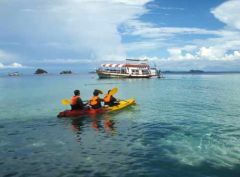 The price is 600 Baht, including ferry ticket and transfer to your resort on the island. The Government Buses. These run from the airport bus station (also called the Transportation Center) direct to one of the piers at Laem Ngop. There are 3 departures each day, at 7:10, 8:20 and 10:20 in the morning. If you miss the last Laem Ngop bus, then take the 9908 to Trat city at 11:40. Both services cost around 280 Baht. To find the Transportation Center at the airport, go out of exit 5 on the arrivals level, cross all the roads, then wait at the bus stop that is clearly marked "Shuttle Bus". The shuttle bus arrives every 10 minutes or so, and will take you to the Airport Transportation Center for free. Getting to Koh Chang from Bangkok City Center. Prices and Timetables here. If you're travelling from a Bangkok City hotel, we can pre-book your minibus transfer direct to your resort on Koh Chang. This costs 900 baht per person, and the minibus will pick you up at your hotel in the morning, for arrival on Koh Chang in time for an afternoon swim. 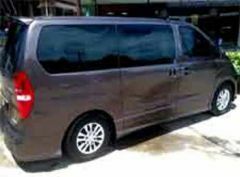 We can also of course also provide a private car or minibus to easily transport you from your Bangkok hotel direct to your resort on Koh Chang. 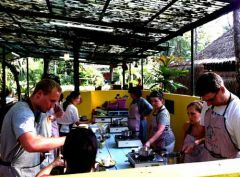 Price is usually between 3,900 and 5,500 baht, depending on the number of people. 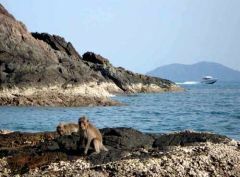 If you decide to travel to Koh Chang independently, the best way is to take the 999 bus from Ekamai Bus Station to "Laem Ngop", which is the port with 2 piers serving Koh Chang. There are 3 departures each day, at 6:30, 7:45 and 9:45 in the morning. If you miss the last Laem Ngop bus, then take the 9908, also from Ekamai, to Trat city, at other later times during the day. Both buses cost around 250 Baht. 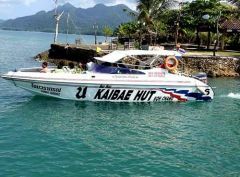 If you arrived on the 9908 bus from Bangkok (city or airport), then simply ask one of the waiting taxi drivers to take you to Ao Thamachat pier for the Koh Chang ferry. They may well insist on taking you to Centrepoint Pier instead, which is not such a good service, but it's not worth the hassle in trying to insist otherwise. 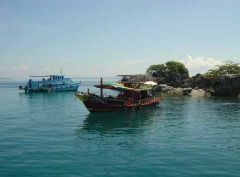 Centerpoint is a slower, less regular service, and the arrival pier on Koh Chang is a little further away from the popular West coast resorts. Except for the last 30 KM, Bangkok to Koh Chang is fast dual carriage-way. The terrain is flat, mainly passing though rubber plantations with small mountains usually visible in the distance. Large towns, such as Chonburi and Chantaburi, are bypassed. The largest town-centre is probably Klaeng and this is traversed in just 5 minutes. The most direct route from Bangkok is Highway 7 beyond the airport; route 344 to Klaeng, then national route 3 as far as Kao Saming. 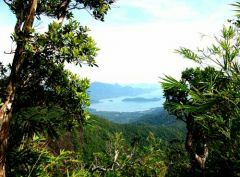 Then take route 3156, following the road signs to Koh Chang, to one of the piers (see below). 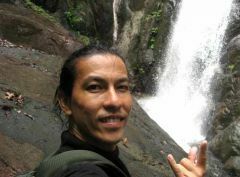 All in, without stops, it's around 3.5 hours driving time from Bangkok International Airport to the pier for Koh Chang. 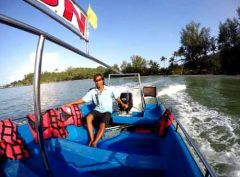 There are 2 main piers from Koh Chang, and they both take passenegers, motor cycles and cars. The third pier uses a small old wooden fishing boat and should not generally be used. Ao Thamachat Pier - This is used by the Koh Chang Ferry company - charges 100 baht one-way for cars, and 80 baht one-way for passengers. The service runs every half hour between 6:30am and 7pm. On the Koh Chang side, you arrive at Ao Subparot pier. Centerpoint Pier - The Centerpoint Ferry company carries cars for free, and charges 100 baht for passengers (160 baht return). The service runs every hour between 6:30am and 7pm. On the Koh Chang side you arrive at Dan Kao pier, and this is further away from the popular West coast resorts. 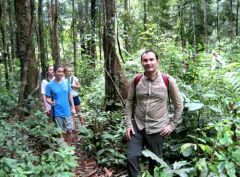 Unless you know Koh Chang well, and are heading to the East Coast, you're 99% certain to want to turn right on the main road to head for the main resorts on the West coast. There will be Song Thaews (open back shared taxis) waiting at the pier for you. Just tell the driver the name of the resort you're heading for, and he'll drop you off there. Price guide per person, and timings: 60B to Whitesands (20 min), Chai Chet (25 min), Klong Prao (30 min). 100B to Kai Bae (40 min), Loneley Beach (50 min). 120B to Bang Bao (60 min). 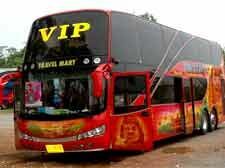 If you're not sure where you want to go, then ask the driver to take you to Coco Dee Bo Tours at VJ Plaza in Chai Chet. We can then give you loads of information and assistance to make sure you find the place that's right for you. 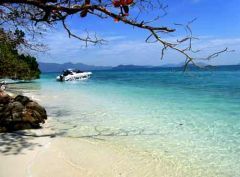 There are 2 or 3 flights a day from Bangkok Suvarnabhumi (International) Airport to Trat Airport, located about 20KM from Ao Thamachat pier. Go to the Bangkok Airways website for schedule and prices, or book with us. Whether the additional cost of flying is worth it is debatable. Read this. 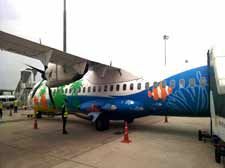 All flights arriving at Trat Airport are met by Bangkok Airways Minibuses which will take you onto Koh Chang by car ferry, for around 470 Baht. 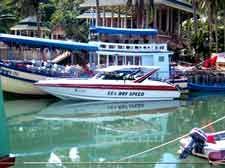 The minibuses, and even the ferries, will wait for the last flight in the evening, so you will always get to on Koh Chang the same day. 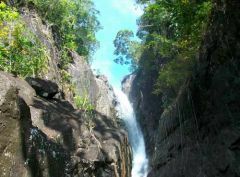 Koh Chang is easily reachable, in one day, from Koh Samet and Pattaya, by minibus bookable through us. From the 3 Cambodian border crossing points at Poipet (for Aranya Prathet), Pailin (for Ban Pakard) and Koh Kong (for Hadlek), you can also reach Koh Chang inside one day. Please let us know if you need to book a private car or minibus to get you to Koh Chang from one of these border crossings. This leaves Ao Thamachat pier at 12:00PM every day. The cost is 350 Baht, inclusive of ferry ticket. The bus will arrive in Bangkok City center at around 5:30PM, calling first at Hua Lamphong Train Station, and then at Kao San Road. You will need to take a taxi from your hotel at about 10:00AM, to Ao Subparot pier. To Bangkok, we have minibuses with pick-up times of 9AM, 9:30AM, 1:30PM. These can take you to any Bangkok City center hotel, to the International Airport, to Kao San Road, or to Sukhumvit. Prices vary from 750 to 900 baht. If you have an evening flight from Suvarnabhumi Airport, then our 1:30PM minibus, arriving at 7:30PM could be ideal for you. 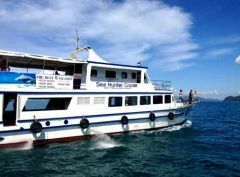 We also have minibuses to Koh Samet and to Pattaya. Pick-up times are about 9:00AM, 11:40AM and 14:40 and the price is 600 or 650 Baht. 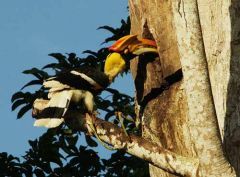 To Cambodia, we can provide a joining minibus to Hadlek and to Aranya Prathet. Full details here. 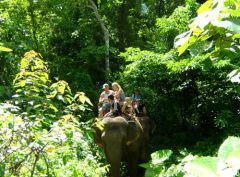 For total flexibility, or for a large group, book a private car or minibus from us to anywhere in Thailand. For large groups, it will save you money. Please contact us for a quotation. 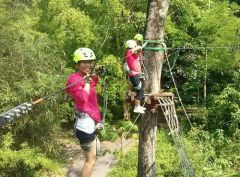 An expensive option, and not necessarily the quickest as you will be leaving your Koh Chang resort up to 3.5 hours before your flight departs from Trat. Flight tickets to Bangkok and onward to other destinations can be bought from one of our shops on the island. Deciding whether to fly or drive - read here - you may save a lot of money for a little extra time spent. For all of our prices and time tables for buses and minibuses, please read here.